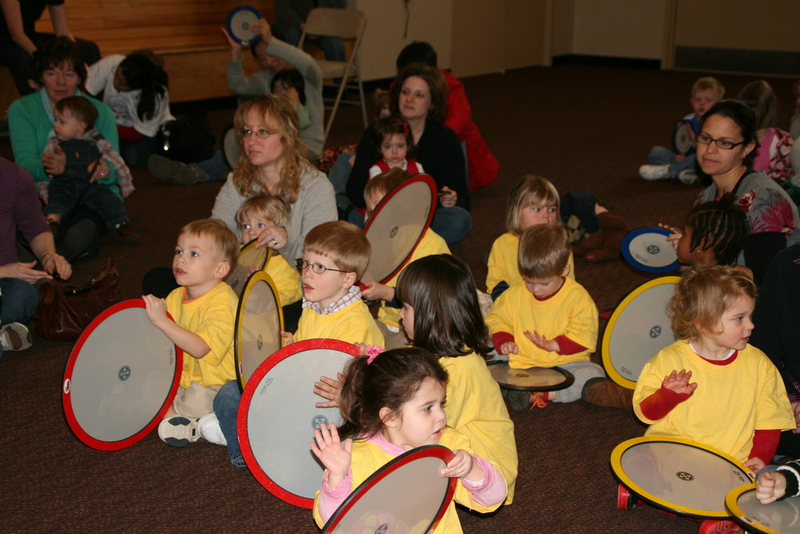 FunDrum's Drum'n'Fun program uses a variety of rhythm-based games and activities to musically empower and connect children. Activities like - Frog Pond, Intergalactic Musical Chairs, Body Beats, Bottle Orchestra, Boomwhackers, and many, many others are used to create learning outcomes through creative play. Drum'n'Fun programs serve groups up to 30 children per session and are individually crafted to meet the needs and abilities of each group. Looking for an innovative way to instill an appreciation for world cultures, geography and music in elementary school aged children? Get your passports ready and invite your students to take a grand tour with the Global Rhythm Journey program. The Global Rhythm Journey is an academic assembly program designed for students (k-5). The Global Rhythm Journey takes up to 250 children (k-5) at a time on an imaginary journey around the world in an academic assembly program. Through exposure to an impressive collection of world percussion instruments, world and regional maps, traditional rhythms and songs, students will learn about geography, culture and music. The audience gets to actively play along on their own instruments as they experience a variety of world rhythms and folksongs designed to teach and entertain. Daily and weekly residency programs involve students in an exploration of musical learning. Not your typical musical educational approach - FunDrum residency programs empower each student with the ability to create wonderful rhythmical music in a cooperative setting. Through carefully selected activities, students will not only learn about musical and social concepts, they will also learn about world cultures, history, geography, science, and much more. FunDrum Rhythm Circles has been dedicated to delivering programs designed to enhance lifestyle quality for older adults for over 16 years. Besides being a really fun activity, playing instruments as a group has been proven to improve morale, promote interdependence and positively affect the body's immune system. Drumming as part of a group can achieve a variety of wellness outcomes far beyond the music produced. Experiential lectures on topics including "History of World Drumming", "Modern Applications of Cultural Drumming", "Drumming for Stress Relief and many others are enriching for active older adult groups up to 25 persons. Senior Drum programs can serve groups up to 50 people and be specifically crafted for groups of seniors with physical limitations as well as those suffering from dementia, Alzheimer's or Parkinson's disease. Nothing celebrates community like a drum circle. It is a fun, colorful, musical expression of collective joy. Imagine everyone from toddlers to grandparents all playing together and having fun while making music. Group drumming involves all individuals regardless of musical ability, age, race or gender. Drum circles create a sense of community by allowing participants to express their spirit through playing percussion instruments within a supportive group setting. Through the collaborative process of blending individual rhythms and different sounds into spontaneous musical pieces, the drum circle becomes a shared expression of creativity and joy. The very process of learning to create music together in the moment is one of the most powerful ways to build community spirit and identity. Consider using a drumcircle event to celebrate a particular milestone or achievement in your community. Bring the people, we bring the fun! Drum circles are a wonderful tool for community spirit building. Besides being an uplifting, wholesome experience, a drum circle can be a tangible celebration of faith and connection with community. FunDrum Rhythm Circles offers a dynamic and powerful program for religious communities. Whether it is a stand alone activity, or incorporating a drum circle into regular service, FunDrum delivers a program that will connect, inspire and revitalize your faith community. When your congregation channels their beliefs and faith through spontaneous music, a very powerful community sound emerges; one that reflects in an undiluted way, the feelings and expressions of the group's faith. FunDrum serves all religions.